Expand your LEGO Dimensions’ horizons with this fun E.T. Extra Terrestrial Fun Pack. Save the day and help E.T. get home! Build your own E.T. mini-figure and use his Illumination, Fix-It, Stealth and Telekinesis abilities to solves puzzles and defeat enemies. 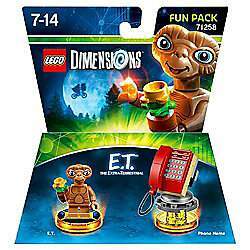 This pack also includes a re-buildable Phone Home Devices. Use your creativity to transform it into a Mobile Uplink or Supercharged Satellite to defeat levels. The E.T. Fun Pack unlocks the E.T. Extra Terrestrial Adventure World and Battle Arena. Collect all of your favourite LEGO Dimensions characters to create a crazy mash-up multiverse. Good price, but the game is dead so... it's to be expected. Heat added! Who even gets these for the game? Lol. I played the game but most of the sets I bought were for the minifigures themselves. When will you otherwise ever get an E.T., Sonic Hedgehog or Stay Puft Lego minifigure? Basically all out of stock now. Knight Rider £7 and ET £6 on Amazon prime.